When it comes to the largest streaming music service globally, Spotify should definitely be listed on the top as it’s available in 79 countries already with 207 million monthly active users, leaving other music platforms like Apple Music, Tidal, Pandora far behind. Currently, Spotify offers two types of memberships to users, including the free and premium plans. With free account, users can only stream Spotify songs online. To download the music from Spotify for offline listening, the $9.99 monthly subscription fee is required. If however, you don’t want to pay for the premium plan, you still get chance to listen to Spotify music offline. 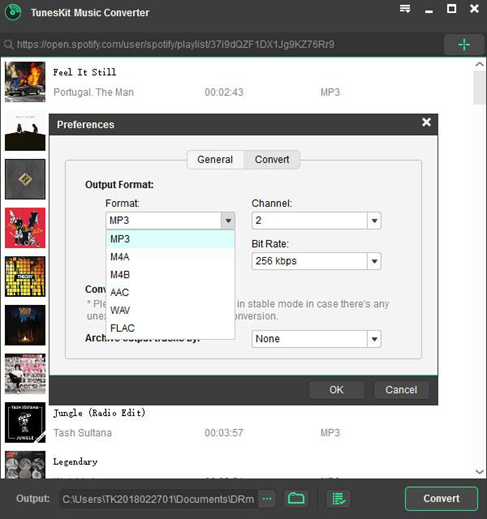 In this case, you only need a 3rd-party Spotify music downloader, such as TunesKit Spotify Music Converter, which can easily extract Spotify songs and playlists offline and save them in MP3 or other common audio formats even with free account. In order to encourage people to pay for the music, Spotify removes advertisements and other limits implied to free subscribers, as well as increases music bitrates to 320 kbps, which is only restricted to 160 kbps for free members. Now with TunesKit Spotify Music Converter, you can enjoy all those unlimited high quality music on Spotify even without upgrading to the premium plan. How? The technology used by Spotify to restrict listening experience for free users is called DRM. Therefore, in order to break the limits, you need to completely get rid of the DRM from Spotify songs. TunesKit Spotify Music Converter is such a dedicated Spotify DRM removal tool with which you can easily remove DRM from Spotify music files, including tracks, playlists, albums as well as podcasts by converting them from locked OGG Vorbis format to MP3, AAC, WAV, FLAC and more. Once converted, you will be able to play any Spotify music track and playlist offline on any MP3 player, mobile device, home sound system, car radio, and so on. What makes this software outstanding among similar Spotify converters is its ability to keep the original music quality such as 320kbps while encoding the songs. It will also preserve the ID3 tags losslessly, including music title, track number, artist, album, composer, and so forth. If in any chance you don’t like the music quality downloaded from Spotify, you can edit the audio parameters within TunesKit Music Converter for Spotify all at your own requirements. Thanks to the built-in audio editor of TunesKit, you can freely make changes to the output music profile, such as the audio channel, codec, bit rate, sample rate, and so on. In general, you can fully control the music in your own way. TunesKit Spotify Converter comes with a clean GUI that is easy to handle by even non-technical person. It only requires three simple steps to complete the whole encoding process. All you need to do is launch the program, and wait till the Spotify desktop client is loaded successfully. After that, you can browse the Spotify store and drag any track/playlist/album from Spotify directly into TunesKit Spotify Music Converter main window. Then go to the Preferences window to set the output music profile if you like. When everything is set OK, click ‘Convert’ button in TunesKit and it will do the rest work for you at up to 5X faster speed. 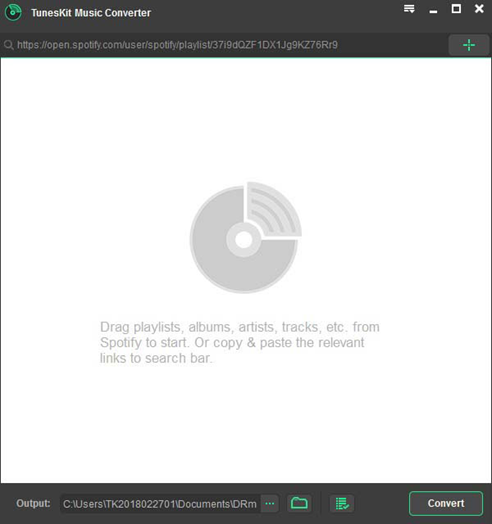 After the conversion, you can load the offline DRM-free Spotify songs in your computer hard drive and copy them to any device for listening or backup. 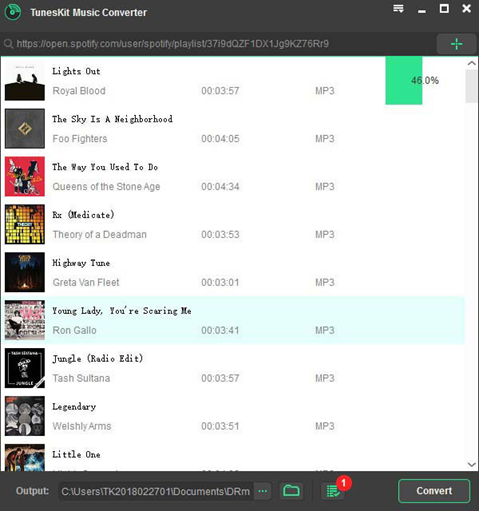 Download Spotify to offline MP3, AAC, FLAC, WAV, etc. TunesKit Spotify Converter for Windows is currently one of the best Spotify music downloading and converting software in the market that can help both free and premium users of Spotify to get full control of the music with ease. It has an intuitive and understandable interface that any user can handle well. It should be the top one choice if you care much about the music quality.